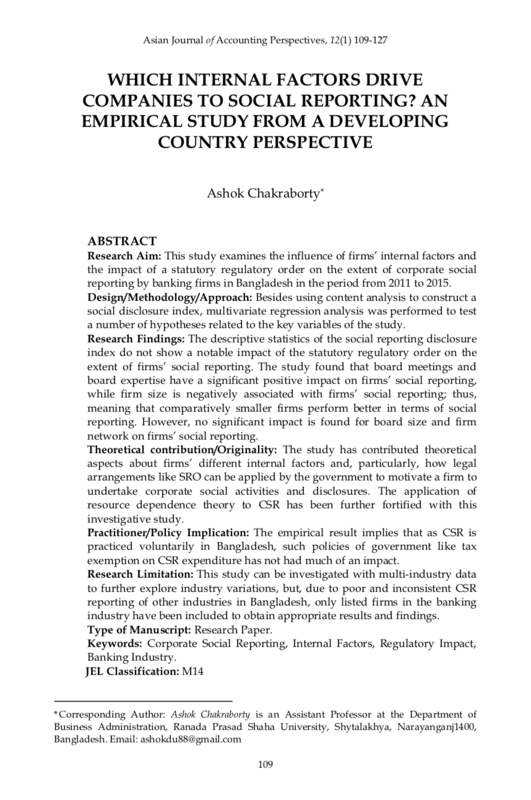 Research Aim: This study examines the influence of firms’ internal factors and the impact of a statutory regulatory order on the extent of corporate social reporting by banking firms in Bangladesh in the period from 2011 to 2015. Design/Methodology/Approach: Besides using content analysis to construct a social disclosure index, multivariate regression analysis was performed to test a number of hypotheses related to the key variables of the study. Research Findings: The descriptive statistics of the social reporting disclosure index do not show a notable impact of the statutory regulatory order on the extent of firms’ social reporting. The study found that board meetings and board expertise have a significant positive impact on firms’ social reporting, while firm size is negatively associated with firms’ social reporting; thus, meaning that comparatively smaller firms perform better in terms of social reporting. However, no significant impact is found for board size and firm network on firms’ social reporting. Theoretical contribution/Originality: The study has contributed theoretical aspects about firms’ different internal factors and, particularly, how legal arrangements like SRO can be applied by the government to motivate a firm to undertake corporate social activities and disclosures. The application of resource dependence theory to CSR has been further fortified with this investigative study. Practitioner/Policy Implication: The empirical result implies that as CSR is practiced voluntarily in Bangladesh, such policies of government like tax exemption on CSR expenditure has not had much of an impact. Research Limitation: This study can be investigated with multi-industry data to further explore industry variations, but, due to poor and inconsistent CSR reporting of other industries in Bangladesh, only listed firms in the banking industry have been included to obtain appropriate results and findings. Type of Manuscript: Research Paper. Keywords: Corporate Social Reporting, Internal Factors, Regulatory Impact, Banking Industry. CHAKRABORTY, Ashok. Which Internal Factors Drive Companies to Social Reporting? An Empirical Study from A Developing Country Perspective. Asian Journal of Accounting Perspectives, [S.l. ], v. 12, n. 1, p. 109-127, feb. 2019. ISSN 0128-0384. Available at: <https://ajap.um.edu.my/article/view/16890>. Date accessed: 20 apr. 2019.